In my last post I shared how to make these cute paper quilled spirals! 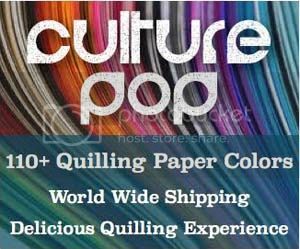 One of the great things about them is that you don’t even need a quilling tool. Just some paper strips and glue. 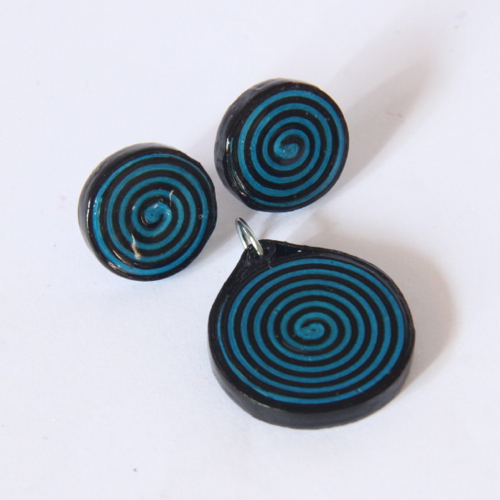 Today I want to share how to use these spirals to make an awesome set of jewelry! The first step will be to make your spirals! 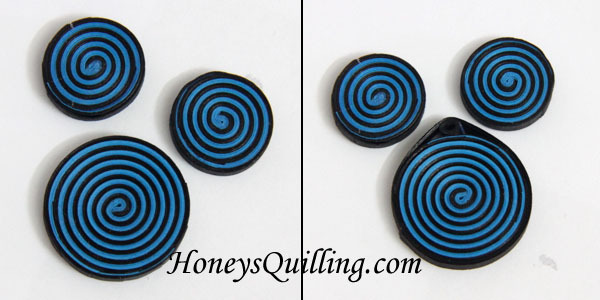 Click here and follow the directions for making the fat spiral (of course you can use any of the circles you’d like, but these particular supplies listed above are for the fat spirals). 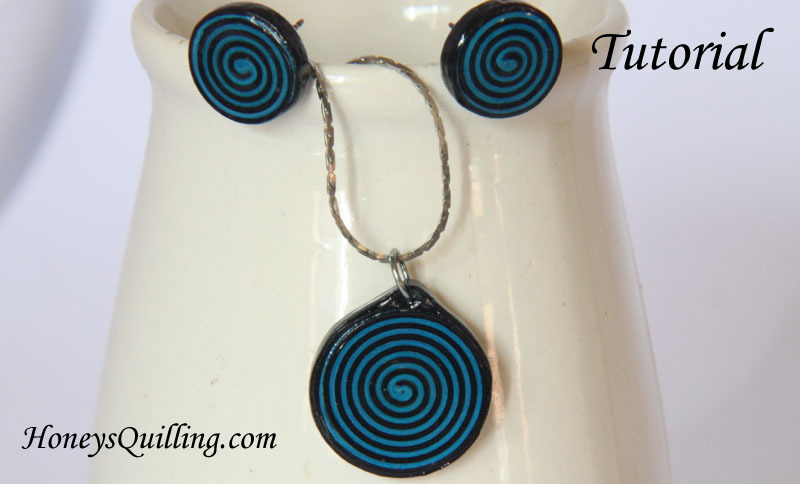 For each earring use 6 strips of 6″ turquoise paper and 6 strips of 6″ black paper. Now it’s time to add sealant to your pieces! There are MANY products out there that you can use for sealants. You can click here and scroll down to find the posts I have written about sealants. I am planning more detailed posts about individual sealants as well. For this post I’ll just share what I did. Firstly I used a liquid sealer . The reason I like to use a liquid sealer as the first step in most of my jewelry is that it soaks into the paper readily and stiffens it. Anyway, back to what I did…. For sealing solid discs like this, pour a bit of liquid sealant into a little cap and use tweezers to dip it in. Let it sit there for no more than 2-5 seconds, or the colors can start to run into the sealant and into each other. Pluck it back out and set it on a tissue to absorb the excess sealant. Don’t let it sit on the tissue for more than a minute or it could start to stick to the tissue! Move it from the tissue onto a plastic/non stick surface to dry. When it dries it gives a lovely super shiny finish! I applied a thickish layer to the pieces (after the liquid sealant had completely dried!) one side at a time. Let one side completely dry before doing the other side. 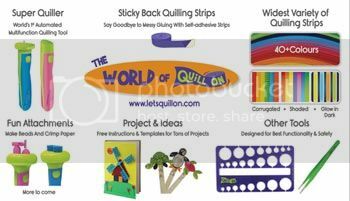 Use the tip of a needle or your needle quilling tool to pop any bubbles if necessary. Once you have applied the PPA glossy to the front and back and they are completely dry, you still need to do the sides. Pardon the horrible photos here! I first glued the earring pieces to the ear posts, and I added the jump ring to the pendant and hung it up on my jewelry stand. When the earrings and pendant were hanging on my earring stand, I applied a layer of the PPA glossy around the edge as you can see (the one on the pendant had started to dry when this photo was taken). If you apply the PPA on the edge and then lay it down on a surface to dry, you can end up with it not looking perfect as there could be a tiny flat edge on the part that was touching the surface. So I like to do the final step with the jewelry hanging. The third photo below shows the finished set. It is beautiful and glossy, it hardly looks like paper! If you want your finished piece to look more like paper, just stick with the liquid sealant and/or another matte sealant. Have fun creating your own unique spin on this design, and do let me know if you give it a try! Thanks for sharing 🙂 Diluted craft glue can work ok if you don’t care if it is long lasting. It is not nearly as water resistant as those sealants/topcoats/glazes that are purposely made for that purpose. If it gets wet it can turn white and ruin the finish. So if you are selling your pieces you will want to invest in a more proper topcoat. I tried it. But, I can’t make shine on it. Please give me some tips. Hi 🙂 the shine that you get on your piece will depend on what product you use. For this I used PPA gloss (perfect paper adhesive). What product did you try?